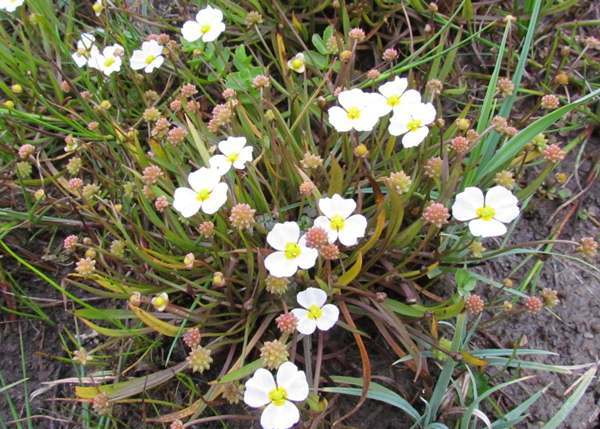 This aquatic plant has long, curving stems each bearing a flower with three short green sepals and three pale mauve petals with somewhat ragged edges. Flowers are typically 12 to 16mm across. The mace-like seeds are nutlets and very reminiscent of those of members of the buttercup family Ranunculaceae - hence the specific epithet ranunculoides, meaning like a buttercup (seedhead!). Plant height depends on the subspecies (two have been proposed). One subspecies is a creeper while the other is more erect. Wherever we have found it, Lesser Plantain grows to typicaly 20cm tall. The leaves vary in shape: those beneath the water surface are strap like, while aerial leaves are narrowly lanceolate. Found throughout Europe from Scandinavia down to the Mediterranean region as well as the Middle East and northern Africa, in Britain and Ireland Lesser Water-plantain blooms from May to September. In the wild this plant often grows with its roots in mud submerged in still or slow-flowing water, so ditches, canals margins and pond margins are good places to investigate when looking for it. 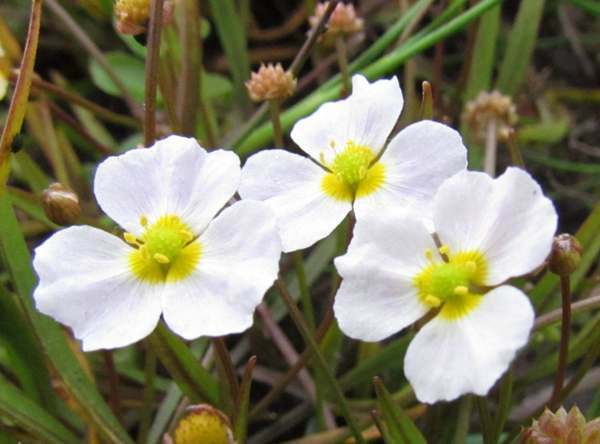 Marshes, bogs and other permanently waterlogged ground are also suitable habitats for this fairly rare wildflower.